We recently transformed Red Oak Floors, what many think as an early 2000s outdated trend, into beautiful white washed ones! We know this can be a hard task, and based on the number of questions we received about how we did it, we knew we had to share our process! Our first piece of advice is to do your research. There are so many stain varieties it’s important to know what look you want to achieve before you reach out to a contractor or take on the transformation on your own. If you have any extra wood from your home, we suggest testing different stain samples out to see the results. Remember all grains of wood are different, thus every stain will look a little different depending on your wood. * A quick contractor note* Hire someone you trust and show them the color you are wanting. 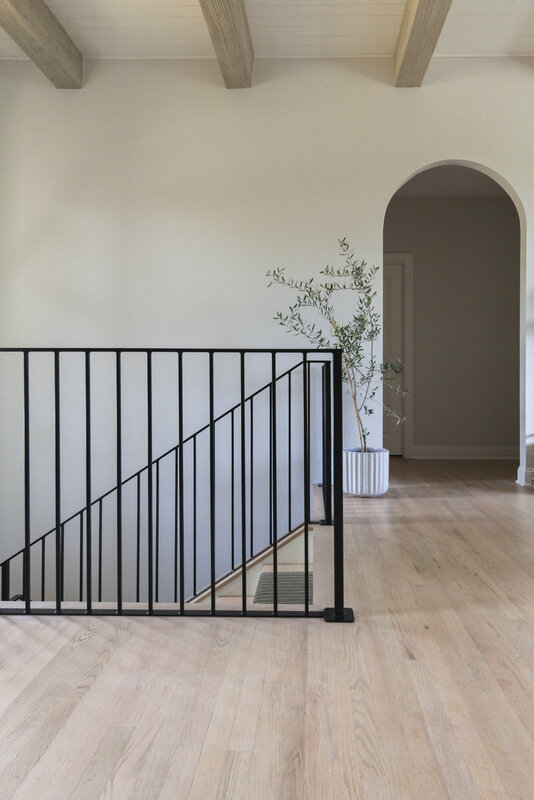 Since this can be a hard process and one that may require a few extra steps, it’s important to consult with your contractor beforehand to get the look you want with an accurate price estimate. 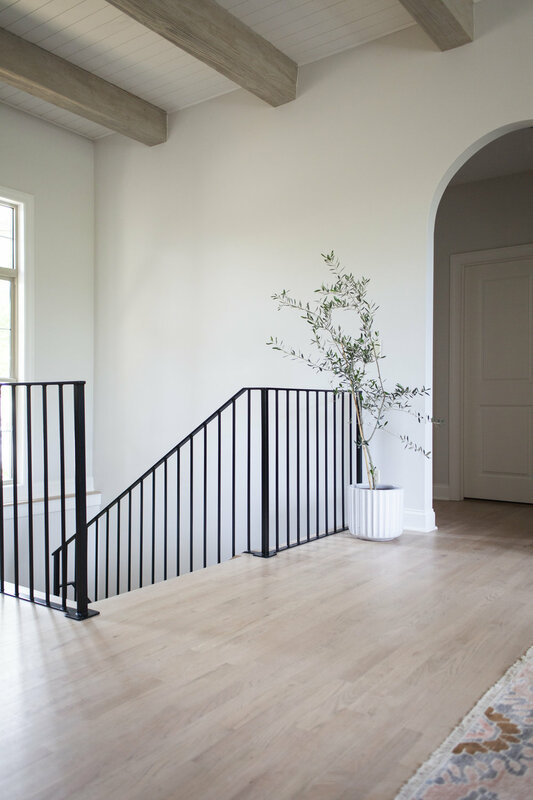 We have found a lot of contractors like to stick to what they have done in the past or steer away from flooring stains that may be more difficult, so just make sure you are upfront about the results you want and stains you want to use. We had 3in Red Oak Floors from 2004. They were originally stained in a natural honey color followed by a polyurethane. Polyurethanes/finishing products are not created equal and some tend to amber or “orange” over time. Some people might rip these up and put in completely new engineered floors, but that tends to be a bit more expensive and we wanted to keep what they had in the house. The first step is sanding down the floors completely. After that, it’s onto the stain. 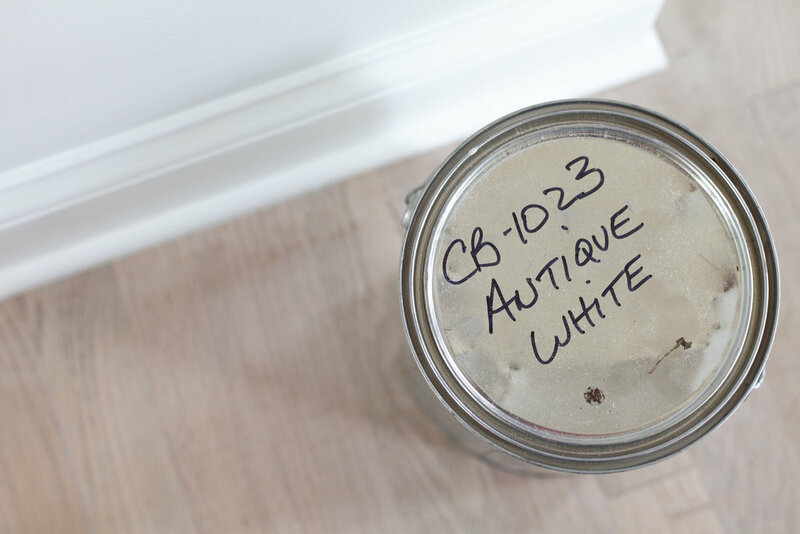 We used Antique White CB-1023 by EZStains (which we purchased at Johnson Paints, but can also be found online at EZStains.com). We had originally tested out a clear coat too, but the floors still had a red/orange tint to them. The biggest challenge with Red Oak is the red. Which, when attempting to go with a lighter shade can appear pink. We used the antique white to cut down this pink tint. After the stain, we went back over them with a wiping stain. We used Pickling White by Old Masters. You wipe it on against the grain and then wipe it off. It is an opaque white-pigment and when you wipe it off it stays in the grain and creates that white washed look. Lastly, we finished them off with Masters Armor in the flat finish by Old Masters as well. It will usually require about two coats but provides your floors with durability and a beautiful final matte finish. We particularly love this finish because we found a matte option and most polyurethanes are in a satin or high gloss finish. A lot of polyurethanes are also known to yellow over time, this one does not.